Help us help others... Purchase a handmade Diengie Market Bag and provide for those in need. One recycled burlap bag can accomplish so much. When you buy a reusable, eco-friendly Diengie Market Bag, you're not only doing something good for the environment, you're also supporting our non-profit organization. Each bag sold allows us to help families that will otherwise go without. Purchase your custom Diengie bag today as part of our fundraising effort and cross off a gift on your birthday, Monther's day, or Christmas list. 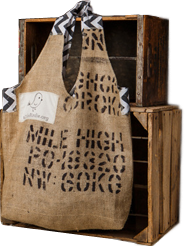 Each hand-crafted bag displays aLittleBirdie.org's logo, is made from coffee been sacks (burlap) and has been expertly stitched with repurposed fabric selected by the designer for you. Fabric colors and patterns will vary on every bag.